This is what I look like when I pretend I’m taking down the empire with a hammer. 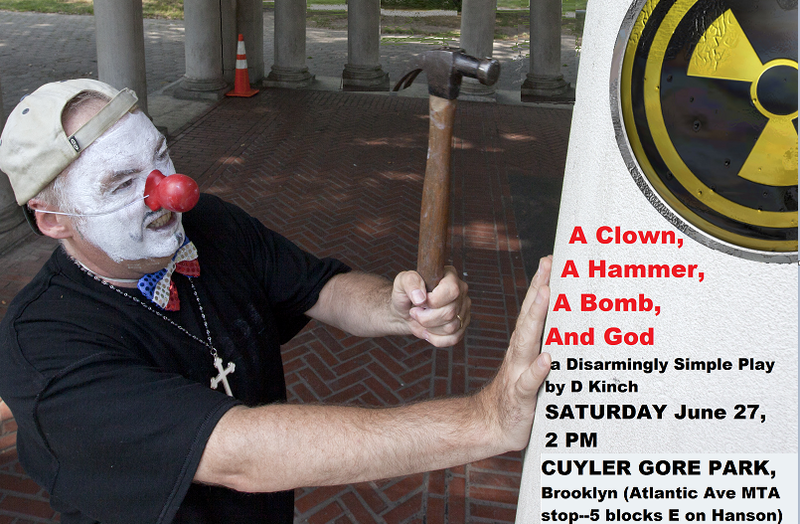 This coming Saturday I will once again don whiteface and a clown nose and tell people the story of a clown, a hammer, a bomb, and God. It is about a pacifist priest named Carl Kabat who disarmed a Minuteman III missile on Good Friday 1994 (which was also April Fool’s Day) while wearing a clown suit. It has been done a lot over the years, but it went on hiatus back in the ‘aughts’ because if you promote peace, the terrorists win. There’s more about its storied history here. I revived it after the Occupy Wall Street movement got started because, hey, protest is protest. Also, in all the condemnations of the 1% over their economic chicanery, we seem to have forgotten that the empire has some 1,950 nuclear missiles armed and ready to fire off at a moment’s notice. Since the estimates are that a mere 500 such explosions over the world’s largest cities would put us back to the Dark Ages in terms of population and economy, that’s no small power to cede to people in suits. The play will be at Cuyler Gore Park in Brooklyn this Saturday. Showtime is/should be at 2 PM. Free. You’ll laugh, you’ll cry, you’ll wanna go stop the empire.